Solve Report Builder enables your team to access a wide range of Solve data directly from within Google Sheets. Summarized operational data and robust dashboards, give you a snapshot of your business from both desktop or mobile. Introducing the “Activity Changes” report. Monitor which tasks, follow-ups, notes, deals, or interactions (i.e. calls) your staff have touched. How are junior rep’s calls going? What tasks were completed recently? What notes and information are streaming in? Is the team keeping in touch with top clients? When teams have more insight to where staff are spending their time and what the results are, resources get allocated to where they’re most valuable. 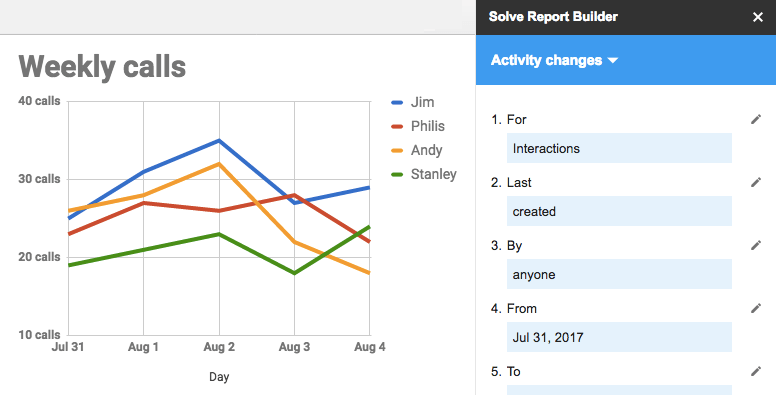 The “Activity changes” report is particularly useful for Solve Client Manager members who want to see what’s happening in their team.